ROCKSPRINGS, Ohio — Third string quarterback Cory Cox hit Weston Baer with an eight-yard pass with 22 seconds left to give the Meigs Marauders a heart stopping 14-8 win over the Gallia Academy Blue Devils Friday night at Farmers Bank Stadium in Meigs County. Cox was pressed into duty under center after Meigs lost two of its top playmakers due to potential severe injuries in the first half. Quarterback Zach Helton and end/quarterback Christian Mattox both went down with what looked to be serious injuries. But it was 5-foot-8 sophomore Cory Cox who stepped in to lead the Marauders on a 77-yard, 11-play drive, running the two-minute offense to near perfection for the winning score as the Marauders took over with 3:06 left. It was a hard-hitting, well-played game between the two schools that left everyone in the stands as drained as the two teams. Meigs received the opening kickoff and Gallia Academy’s defense stopped them on a three and out. Marauder Coach Mike Bartrum tried a fake punt on fourth down that the Blue Devils stopped short of the first down. Gallia Academy started on the Marauder 34, and with Boo Pullins and Jacob Campbell doing the damage, the Blue Devils drove to the Marauder three. On third and goal, Campbell coughed up the football and Landon Acree recovered for Meigs in the end zone to end the threat. Gallia Academy was on the drive in the second period, but on fourth and eight Justin McClelland’s pass to Tanner Allen was stopped short of the first down. Later in the period, the Marauders drove to the Blue Devil 26 — but Cox had his pass tipped and picked off by Tanner Allen to end the threat. The Blue Devils took advantage of a 90-yard, 20-play drive to score the game’s first touchdown. On fourth and two from the Marauder 12, McClelland hit Cory Call from 12 yards out for the score on the final play of the half. On the extra point attempt, McClelland once again hit Call and the Blue Devils went into the locker room on top 8-0. Meigs came out in third period and scored on their second possession after driving from its own 38 in an eight-play drive to pull to within two. On second down, Cox hit Baer for 34 yards to the Blue Devil 33. Seven plays later, it was Cox once again finding Baer in the corner of the end zone from 22 yards out. The extra point was stopped just short, but the Marauders had pulled to within 8-6 with 3:30 left in the third period. The Blue Devils appeared to score midway through the fourth period, but a holding penalty brought the play back. Gallia Academy then took advantage of a 17-yard run by McClelland and a 36-yard run by Campbell to the Marauder 24, but the Marauder defense stiffened and held on downs. A 33-yard punt by Boo Pullins gave the Marauders the ball at their own 13 with 3:06 left. On third and five, Cox hit Cole Adams over the middle for 26 yards to the Meigs 44. Three plays later, Cox hit Adams on an identical for 25 yards to the Gallia Academy 44. On third and 12, Cox hit Baer for 25 yards to the Blue Devil 8. 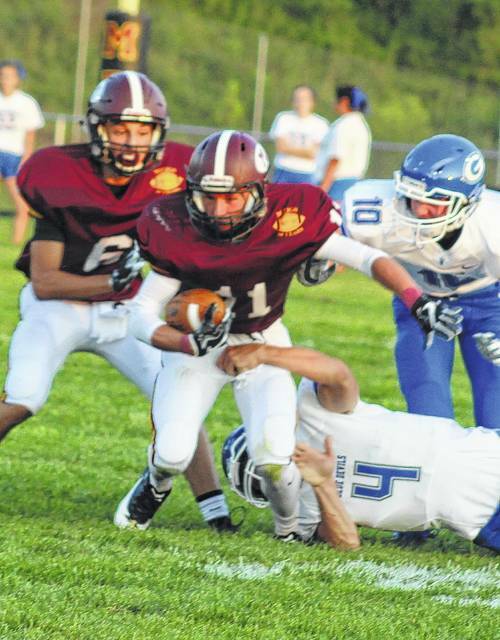 Meigs — without time outs — had Cox ground the ball to stop the clock with 22.7 seconds left. Cox then hit Baer on a fade pattern in the end zone for the score. Cox and Baer once again hooked up for the two-point conversion and the Marauders were on top 14-8. A 16-yard return of the kickoff by James Armstrong gave the Blue Devils the ball at their own 40 with 17.2 second left. Three incomplete McClelland passes later and the Marauders pulled out the win. Meigs played the game in throwback uniforms to honor the school’s first football team that took the field 50 years ago this season. That first Marauder team that went 9-1 and won the SEOAL championship was honored with a celebration before the game. Adams led the Marauders ground attack with 74 yards in 11 tries, some coming out of the wildcat formation. Lane Cullums added 16 in seven tries and Zach Helton added three carries for 14 yards before being injured. Cox was 11-of-16 in the air for 164 yards and two scores. Helton was 4-of-4 for 13 yards before leaving the contest. Sophomore Weston Baer was impressive with four catches for 58 yards and two scores. Adams added three for 59, Zach Bartrum three for 19. Gallia Academy’s fine junior quarterback McCleland led the Blue Devils with 91 yards in 17 carries. Jacob Campbell added 87 in 16 tries and Boo Pullins had 44 in 15 tries. McClelland was 9-of-31 in the air for 89 yards. Garrett Burns caught five for 34 yards. Meigs will stay at home next week for a rare Saturday night contest with St. Clairsville, while Gallia Academy travels to River Valley. 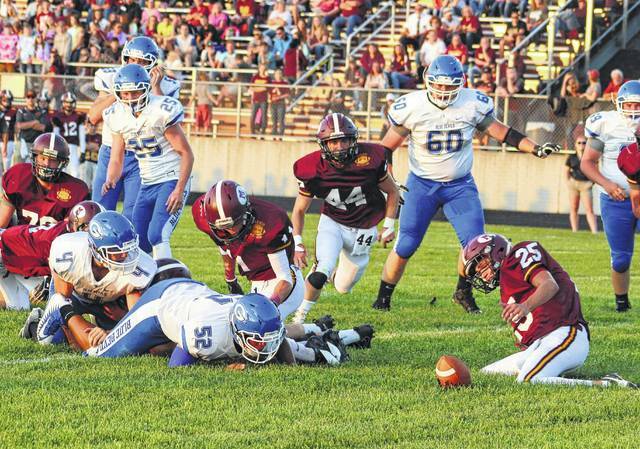 Meigs sophomore Landon Acree, right, falls on a fumble in the end zone during the first quarter of Friday night’s season opening football contest against Gallia Academy at Farmers Bank Stadium in Rocksprings, Ohio. Meigs senior Christian Mattox (11) tries to elude a tackle by Gallia Academy junior Jacob Campbell (4) during the first quarter of Friday night’s season opening football contest at Farmers Bank Stadium in Rocksprings, Ohio.